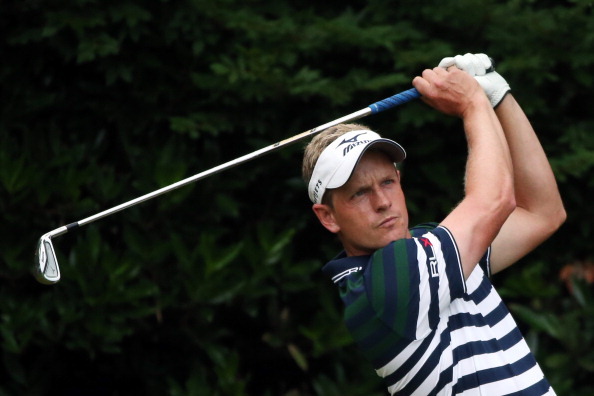 Tiger Woods was trying to fight his way into contention while Britain’s Luke Donald was hoping to stay atop the leaderboard as the first round of the 113th US Open resumed Friday at Merion. Thunderstorms twice stopped play on Thursday for about four hours and 15 minutes, leaving half the field of 156 to finish round one Friday morning and then return to the rain-soaked 6,996-yard layout to start the second round. Phil Mickelson, the five-time US Open runner-up who yearns to finally claim the trophy, owns the clubhouse lead at three-under par 67. The US left-hander, who turns 43 on Sunday, played on little sleep after a cross-country flight to attend his daughter’s Amanda’s eighth-grade graduation, but fired three birdies after an opening bogey Thursday to seize the lead. Donald, seeking his first major title, birdied his final three holes before dusk to stand on four-under through 12 holes of his first round, but still had the toughest portion of Merion’s formidable course ahead of him twice on what figures to be a 23-hole day for the Englishman. World number one Woods, seeking a record-tying fourth US Open title and his 15th major crown, stood at two-over through 11 holes after making a two-foot par putt at the 11th just after play resumed in a mild morning rain. Woods appeared to be nursing a sore left wrist, grimacing twice after blasting shots out of the rough, but said later he was fine. With 25 more holes on tap to finish on Friday, he needed to be in good health. Woods, who has not won a major title since the 2008 US Open, is in the feature group with third-ranked Masters champion Adam Scott of Australia, who shared second at two-under through 11 holes, and Rory McIlroy, who shared 16th on level par for 11. Despite drenching showers for the third time in a week, Merion proved a tricky test for golf’s top talent. Among those in the clubhouse, Belgium’s Nicolas Colsaerts was second on 69 with South Africans Charl Schwartzel and Tim Clark, Americans Jerry Kelly and Rickie Fowler and Australian Jason Day on 70. Some players were set for as many as 32 holes on Friday while those who finished round one were looking at starting a second round with little chance of finishing before dark. With Friday’s last scheduled second-round tee times at 5:57 p.m., there appeared little hope of making the cut before Saturday morning, but dry forecasts hinted players could be back on schedule for Sunday’s final round. “As the week wears on and the conditions get a little bit dryer, a little bit firmer, I think the course is going to get even more difficult and the scores are going to hover very close to par,” Mickelson warned.